The idea of using flash-based storage in a notebook isn't new. Nevertheless, the high cost of flash has prevented it from replacing hard-disk drives on mainstream notebook PCs, despite some advantages in power consumption, shock resistance, and speed--until now. As prices continue to drop, flash-based solid-state drives (SSDs) have become viable options for handling your notebook's primary storage requirements. Moreover, today's roomiest SSDs have 32GB of memory, enough to do more than satisfy basic storage needs--making them competitive with 1.8-inch hard-disk drives, which range in capacity from 30GB to 80GB. 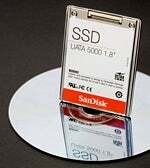 These SSDs, available from companies like Samsung and SanDisk, are lightweight (the SanDisk UATA 5000, for example, weighs 59 grams--just over 2 ounces) and can be found in portables from Dell, Fujitsu, and Toshiba. Are they worth the extra dollars? In spite of price drops, SSDs cost $400 to $500 more than ordinary hard drives of the same capacity. To justify the price difference, SSD notebooks must demonstrate significant performance benefits over notebooks equipped with standard hard drives. To find out whether they do, we tested three pairs of ultraportable notebooks from Fujitsu and Dell. The two test models in each pair of laptops were identically configured, except that one had an SSD, and the other a typical 1.8-inch 4200-rpm hard drive. Two of the notebooks--Dell's 6.25-pound ATG D620 ($3015 with SSD, $2815 with a 80GB hard-disk drive) and Fujitsu's 2.5-pound LifeBook P1610 ($2578 with SSD, $2029 with a 30GB hard-disk drive)-- ran Windows XP Professional. The third notebook, another LifeBook P1610 ($2548 with SSD, $1999 with a 30GB hard-disk drive) ran Windows Vista Business. Results were mixed: In several cases, our tests bore out the advantages of SSD, in other cases, the hard-disk-based models led the way. Our benchmark suite for testing system performance, WorldBench 6, Beta 2, showed no definite pattern in overall results between SSD systems and hard-disk-drive systems. For example, the two Dell ATG D620 models, packed with a 2.0-GHz Core 2 Duo T7200 CPU and 1GB of memory, each earned a mark of 76 on WorldBench 6. In contrast, the two Fujitsu LifeBook P1610 units, configured with a 1.2-GHz Core Solo U1400, 1GB of memory, and Windows XP Professional, differed in performance: The SSD version received a score of 42, while the hard-drive version received a 39. Interestingly, the performance difference was even more pronounced in the pair of Fujitsu P1610 models running Windows Vista Business. Here, the SSD version of the notebook finished with a 36 on our WorldBench 6 beta tests, while the hard-drive version posted only a 30. The Vista-based Fujitsu system with the SSD did especially well on our Adobe Photoshop CS2 image manipulation test, besting the hard-drive version by 36 percent, and on our Nero 7 Ultra Edition disk burning test, where it outperformed its counterpart by 76 percent. The SSDs achieved superior performance in all three pairings on only two types of applications: drive-intensive tests like our Nero 7 Ultra Edition disc burning, and WinZip 10.0 file compression tests. The SSD versions of the two Fujitsus also earned higher marks than their hard-disk doppelgangers on our Photoshop CS2 test, but on that test the hard-disk Dell outran the SSD Dell by 10 percent.